Familiar foes: Serena Williams and Angelique Kerber. 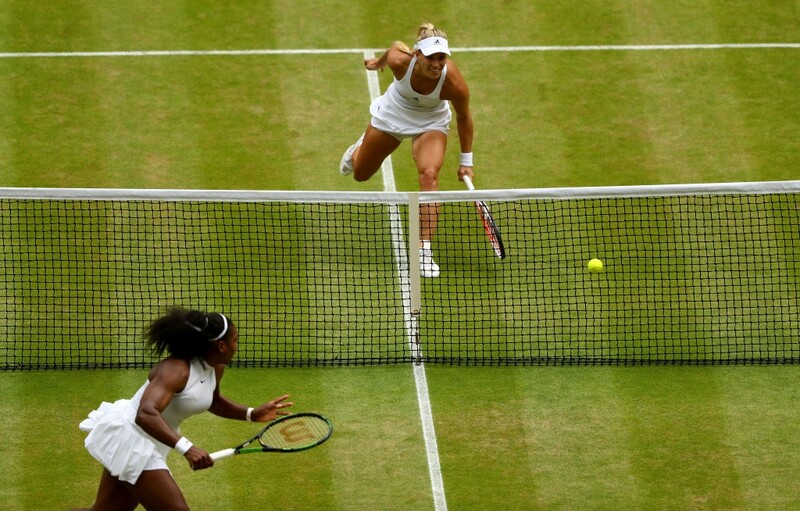 The last time Serena Williams took on Angelique Kerber in a Wimbledon final, Serena wasn’t married and hadn’t got pregnant yet, Kerber was a freshly-minted Grand Slam champion from her Australian Open triumph over the American six months earlier, Jay-Z and Beyonce flew in on a helicopter and were in Serena’s box, Ellen DeGeneres was sat next to Billie Jean King in the Royal Box, and Centre Court witnessed one of the best finals in recent memory. Serena matched Steffi Graf’s Open Era record of 22 Grand Slams that day by defeating a fourth-seeded Kerber 7-5, 6-3, then went on to break it when she lifted the Australian Open trophy in January 2017, while she was pregnant. Now facing off against Kerber for a third time in a Grand Slam final, Serena is bidding to match Margaret Court’s all-time record of 24 majors won. Kerber, the current world No. 10, is looking to add to her two Grand Slam titles, and prove that she is officially back following a difficult 2017. Both former world No. 1s have dropped one set each en route to the final and played brilliant semis to reach this point. Here’s a numbers guide to Saturday’s blockbuster meeting. 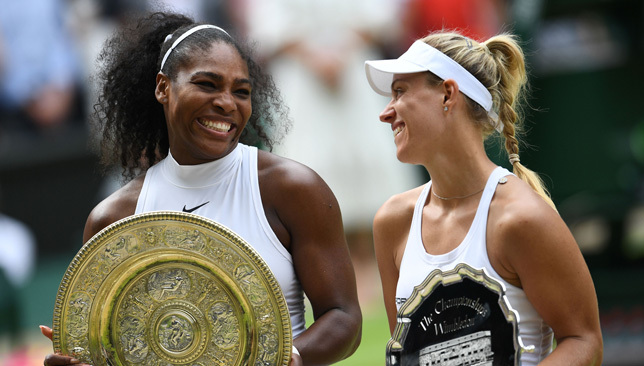 1 – Kerber is looking to become the first German woman to win Wimbledon since Graf in 1996. 3 – For the third time in the Open Era, both women’s finalists are not seeded in the top-10. 3 – Kerber is only the third player to face Serena in three or more major finals, alongside Venus Williams and Maria Sharapova. Venus is the only player to defeat Serena twice in a Slam final. 4 – Grand Slam finals Kerber has now reached. 4 – Serena is bidding to become just the fourth mother to win a Grand Slam in the Open Era. 4 – This is just Serena’s fourth tournament back from maternity leave. 4 – Kerber will rise to No. 4 in the world if she wins the title, and No. 7 if she loses the final. 6 – Kerber is one of six German women to reach the Wimbledon final in the Open Era. 7 – Wimbledon titles Serena has won so far in her career. 12 – kilometres run by Kerber through her six matches at Wimbledon, compared to 6.3km run by Serena. 12 – top-10 wins for Kerber this season. By contrast, she recorded just one top-20 victory in a sub-par 2017. 18 – Serena is making her 18th main draw appearance at Wimbledon. 23 – Slams won for Serena from 29 finals played. That’s a 79% winning rate in major finals. It’s the second-best winning percentage in the Open Era. 24 – Serena’s bidding to match the all-time record of 24 Grand Slams won. 28 – Serena will rise from 181 to 28 in the world by virtue of reaching the final, and would hit No. 19 if she wins the title. 36 – At 36 years 291 days, Serena would be the oldest Grand Slam singles champion in the Open Era, overtaking her own record set at 2017 Australian Open, if she defeats Kerber. Serena is the third-oldest Grand Slam finalist. 43 – per cent of Serena’s serves have been unreturned this fortnight, compared to 24% for Kerber. 44 – Serena has struck 44 aces this tournament. 80 – the average ranking of Kerber’s opponents en route to the final. 81 – the average ranking of Serena’s opponents en route to the final. 84.8 – million dollars earned by Serena in career prize money prior to this Wimbledon. 88 – Kerber has made a tournament-leading 88% of her service returns. She has won 47% of her return games. 89.4 – Serena’s winning record on grass is 89.4% (101-12 win-loss), the highest among active players. Kerber’s is 71.8% (61-24), which is the sixth-best rate among active players. 106 – Kerber’s fastest serve struck this fortnight is 106mph. That is Serena’s AVERAGE serve speed this tournament. 325 – match wins for Serena at the Grand Slams, against 43 losses. That’s an 88.3% winning rate at the majors. Tunisian Selima Sfar is proud to be flying the flag for Arab women at Wimbledon as she contests the Invitation Doubles tournament for a fifth consecutive year. Sfar, who is the first Arab woman to crack the top-100 and retired from professional tennis in 2011, was invited to play the Legends event for the first time in 2014. She partnered nine-time Wimbledon champion Martina Navratilova on three occasions, lifting the title together in 2016, and played alongside four-time major champion Arantxa Sanchez-Vicario in 2017. This year, Sfar has teamed up with Croatian 1997 Roland Garros winner Iva Majoli at the All England Club, and they beat Tracy Austin and Anne Keothavong in their second match on Thursday, after losing their opener to Kim Clijsters and Rennae Stubbs on Tuesday. Sfar is one of three Tunisians to compete at Wimbledon this year, with Ons Jabeur making the second round in women’s singles, after earning a wildcard by winning the $100k Manchester title in the build-up, and Malek Jaziri falling in the first round in men’s singles. The 41-year-old Sfar paid tribute to Wimbledon organisers for inviting her to take part in the Invitation Doubles tournament each year and is grateful to be representing Arab women at SW19. “I have my greatest memories in this tournament, my birthday is always here, and the fact that they were the first Grand Slam who accepted me here and kept inviting me and being very nice and I think it’s very important that they thought of inviting an Arab, representing this part of the world, this region this culture. They opened the door to that and it’s amazing. For me it was very important,” Sfar told Sport360. During her professional career, Sfar, who is now a commentator for beIN Sports, played in the Wimbledon main draw four times, reaching the second round in 2001, 2002 and 2005. She made the doubles quarter-finals alongside Ekaterina Makarova in 2008, eventually losing to Lisa Raymond and Sam Stosur. “I love this event. I know everybody says that, most of the players say that Wimbledon is magical because of the tradition, because of how beautiful it is, the way they take care of players, everything is just magical there, we are so spoilt,” said Sfar. Isner overcame Raonic to enter the Wimbledon semi-final. 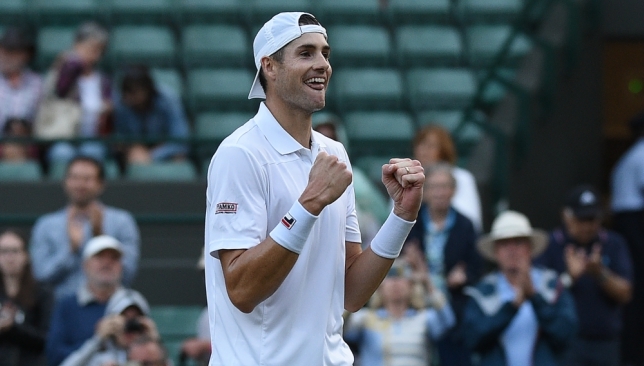 John Isner knows just how he will celebrate if he reaches the Wimbledon final – with a KitKat. The 33-year-old American has long been conscious of the importance of nutrition and diet, but he has been allowing himself a regular chocolate treat during his run to the semi-finals. “After each win throughout these 10 days, I’ve had a KitKat. I’m not going to change that now,” Isner said. It is a routine which has served Isner well, the ninth seed winning the battle of the ace specialists against Milos Raonic in four sets in the quarter-finals. He will face a familiar figure in the last four in the shape of 6ft 8in Kevin Anderson, the eighth seed and conqueror of Roger Federer. Isner stands two inches taller than his South African opponent. Three-time champion John McEnroe has tipped Isner to win. Anderson is a man that Isner played several times on the US college circuit and he leads their professional head-to-head 8-3. Isner added: “There could be a little mental aspect in our match. I say that because our rivalry goes back way before the pro tour. “We’ve been lined up against each other for about 14 years now, because he left Illinois when I left Georgia. We’ve been doing it ever since. “For me this match-up, and I think for him as well, is especially cool. It’s a very nice spotlight on college tennis that one of us, no matter what, is going to be playing in the Wimbledon final. Isner will face Kevin Anderson in the semi-final. 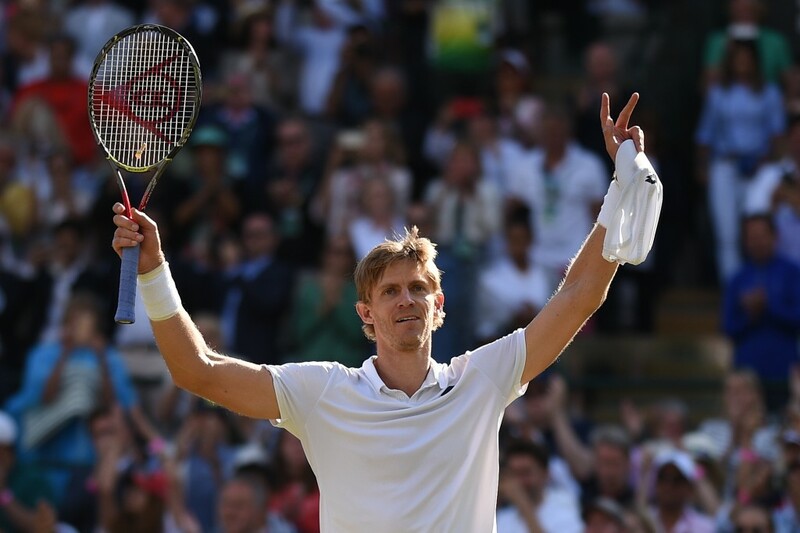 Anderson caused the shock of the men’s tournament when he edged out eight-time winner Federer in a Court One marathon, winning 13-11 in the fifth set on Wednesday. Waiting for the winner will be either three-time champion Novak Djokovic or two-time winner Rafael Nadal. Djokovic, back from injury, is looking close to his best after a four-set win over Kei Nishikori in the quarter-finals while Nadal overcame Juan Martin del Potro in five. The pair have played each other an incredible 51 times, with Djokovic leading the head-to-head by just one. He won their last Wimbledon meeting, in the 2011 final, but retired injured when trailing Nadal in a semi-final at the All England Club four years earlier. “There is no one other match in the history of tennis that is played more than our match,” said French Open champion Nadal. “That’s a big thing. We always played in important stages, important places.